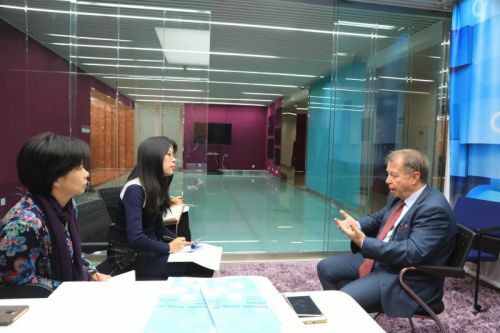 BEIJING, Nov. 9 (Xinhua) – Rapid development of renewables in China has made it a great place to promote diversified use of renewable energy, said Cédric Philibert, a senior analyst of the International Energy Administration (IEA), at an exclusive interview with Xinhua here on Thursday. Besides power generation, renewable energy can be used to address clean energy demand and cut emissions in the industrial sector, and this is just what China’s industrial sector needs for its deep transformation, noted the analyst. According to Cédric Philibert, China’s solar heating industry has seen a slowdown in the past two years after a rapid rise. Meanwhile, wastes of solar and wind power are massive in some remote regions. In the light of this, promoting renewable energy for the industrial sector will likely trigger a huge market for renewables in China. in various industries including fertilizer, steelmaking, building, transport, etc. Now renewable energy development for industrial purpose is still at the beginning stage and is not much profitable. However, given its great potential to cut emissions and promote green development, the Chinese government could consider giving it more financial support especially by procurement of green materials, said the energy expert. In terms of renewables technology, China and IEA have great room for cooperation in joint study and making shared industrial standards, he added.